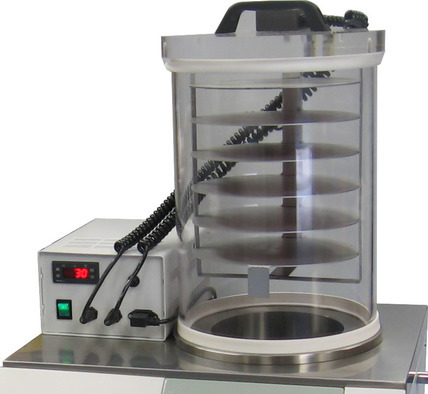 Standard size freeze drying chamber for the Lablyo series of machines. Compatible with all Lablyo models except the Extra. Standard aluminium shelf rack to fit inside our acrylic drying chamber and the product chamber of the Lablyo Plus. 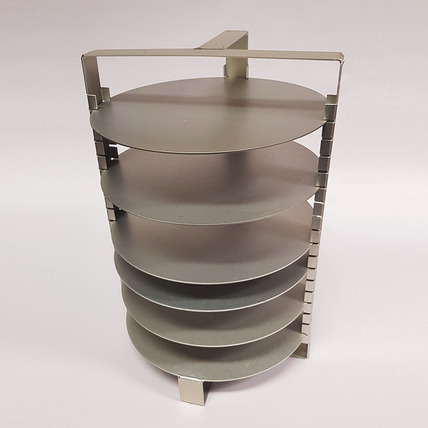 Standard aluminium tray to fit any of our shelf systems. 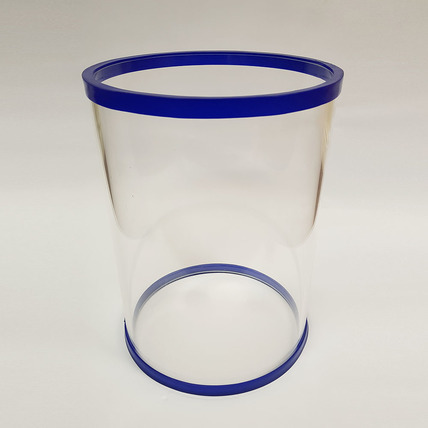 Ideal for holding vials, loose product, etc. Supplied in single units, please order the appropriate number of trays for your requirements. 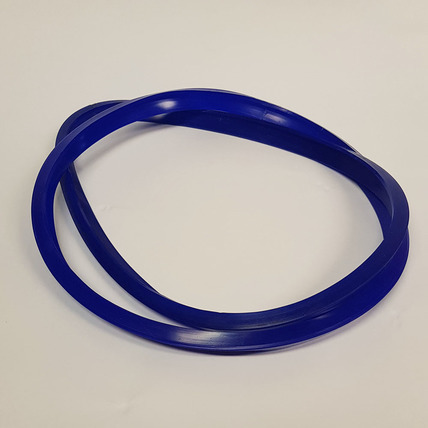 Standard silicone L-Gaskets for vacuum sealing drying chamber, lids, etc. Supplied in pairs as standard. 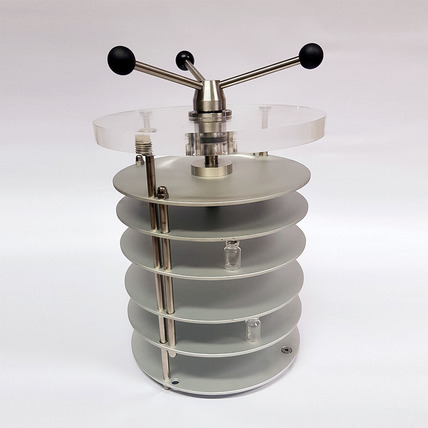 Manual vial stoppering device for vials up to 90mm tall (including loose rubber stopper) over 2 shelves or 52mm tall vials over 4 shelves. 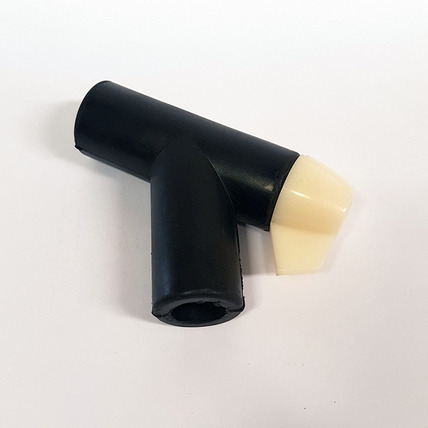 Designed to seal vials containing freeze dried product while under vacuum by pushing in rubber stoppers. 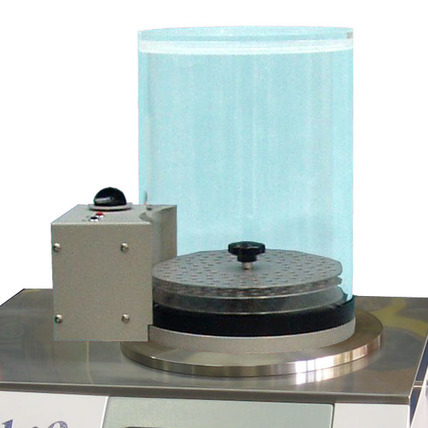 Includes 300mm acrylic chamber, 2 silicone L-gaskets and 4 x 230mm diameter trays as standard. Accommodates up to 340 6ml vials per tray. Aluminium, stainless steel and acrylic construction. 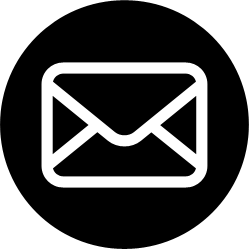 Product shown without accompanying chamber, trays and L-gaskets (included as standard). Fits 8 x quick seal valves (supplied separately) which fit over ground glass cone adapters. Adapter size is dependant on flask neck size. 16-Port column manifold also available. Product is shown with quick-seal valves, 110mm adapters and B24 neck size flasks (all supplied separately). 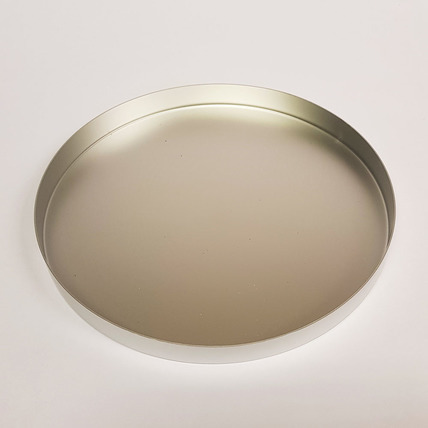 Acrylic and stainless steel lid to fit on our standard 300mm diameter acrylic drying chamber. Ideal if you already have a compatible size drying chamber. Neoprene rubber vacuum adapter seals for use with our manifold columns, lids and Lablyo Extra. Once fitted into a system the valves allow flasks to either be added, vented or removed from the system without disturbing the process. Supplied individually, please order the appropriate number of valves for your requirements. 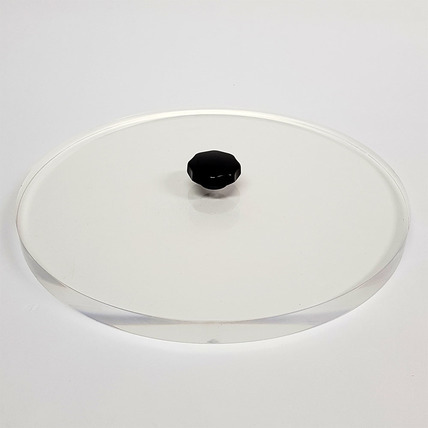 Standard acrylic lid to fit our acrylic drying chamber and Lablyo chamber flanges. 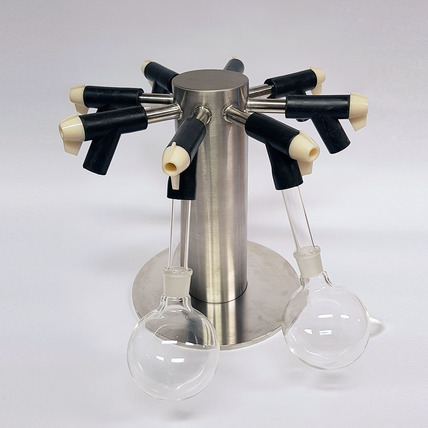 Manifold for ampoule freeze drying to fit onto all Lablyo units except Lablyo Extra. Ampoules can be seals while attached to the manifold under vacuum by melting the neck with a flame. Heated shelves to be used with the acrylic drying chamber to increase the rate of sublimation - speeding up the drying process. Unit is shown with acrylic chamber and silicone L-gasket, both sold separately. Fast freeze ampoules ready for freeze drying. Ampoules sit at an angle facing out at the base. 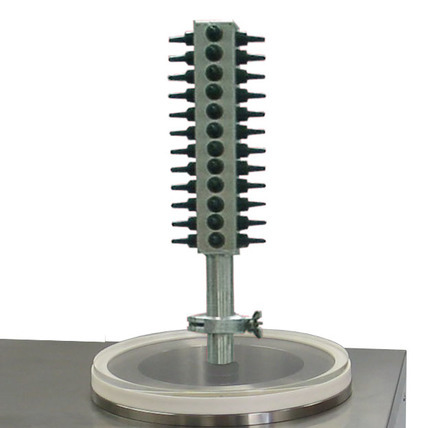 The combination of centrifugal force and vacuum creates a wedge of frozen product stretching up the side of the ampoule. This creates a larger surface area for sublimation and improved drying. Ampoules are then attached to the 48 port ampoule manifold. Changeable plates can be installed to suit the ampoule sizes being used. Standard vacuum pump compatible with all Lablyo models. Standard vacuum hose for connecting vacuum pumps to our Lablyo units. Alternate lid for the Lablyo series allows the unit to be used as a cold trap for solvent recovery or vacuum pump protection. 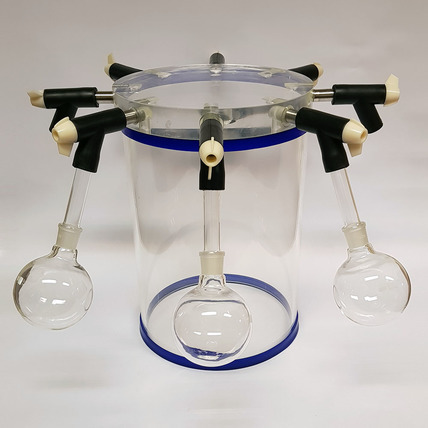 Laboratory glassware (flasks, vials, stoppers, etc) and adapters compatible with our accessory range and other freeze driers are available.